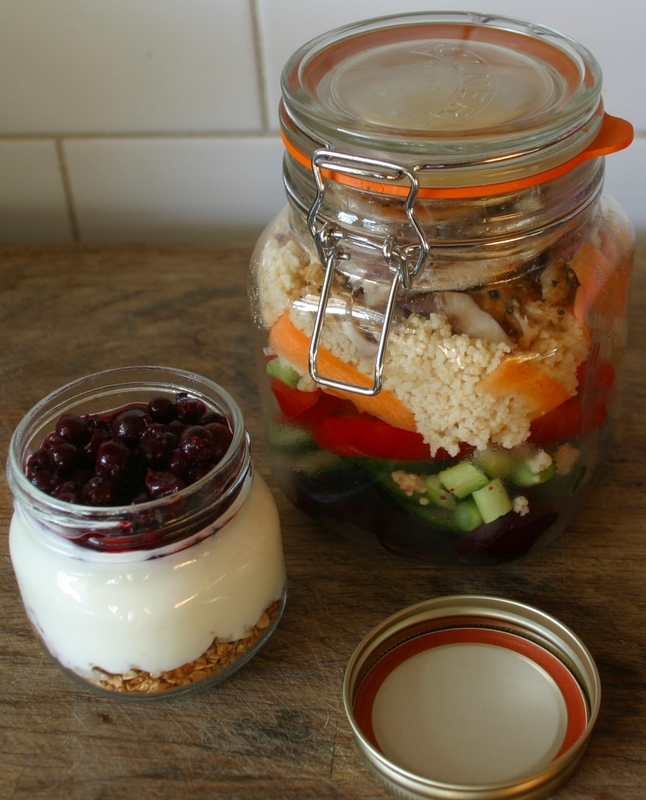 I wanted to do a follow up on my original post as I’ve been using my Kilner Jar for ‘work breakfasts’ ever since. It’s worked really well for me as I find them really filling in a way that cereal bars aren’t. I’ve been experimenting with the best ingredients to keep the fat content low and the flavour high. I initially swapped my fruit compote for frozen berries on the bottom layer, then seeded granola, dried fruit and yoghurt. As I make it the night before work, the yoghurt soaks into the granola, which creates a Swiss-style breakfast that’s really delicious. I’ve just discovered tinned blackcurrants in juice though. This version (pictured) is like eating cheesecake for breakfast which suits me fine. Seeded granola, fat-free yoghurt and tinned blackcurrants only. I’ve been looking for a lower sugar granola as the shop bought one I use is quite high at 12g per 100g, even though I only need about 25g. If anyone can recommend one, let me know. I have to admit that I haven’t used the Kilner Jar as much for salads as it’s much easier to eat a sandwich at your desk. I love the theory behind these salads though. If you put the dressing into the bottom of the jar and then layer ingredients on top, the salad doesn’t go soggy and they’ll stay fresh in the fridge for 3-4 days. Sounds delicious. I am always stuck for lunch when working and if I’m not pre-prepared them I’m stumped as the only food place near my office is a chippy… not good. That breakfast sounds completely a m a z i n g ! Must try this out….. And they look so pretty too! !